A month has gone by since the last earnings report for Apogee Enterprises (APOG). Shares have added about 28.1% in that time frame, outperforming the S&P 500. 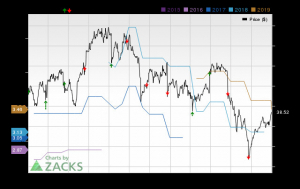 Will the recent positive trend continue leading up to its next earnings release, or is Apogee Enterprises due for a pullback? Before we dive into how investors and analysts have reacted as of late, let's take a quick look at the most recent earnings report in order to get a better handle on the important drivers. Apogee reported earnings per share of 80 cents in third-quarter fiscal 2019 (ended Dec 1, 2018) which declined 11% year-over-year and missed the Zacks Consensus Estimate of 83 cents. The company slashed its fiscal 2019 outlook owing to lower volumes due to project timing delays in the Architectural Framing Systems. Apogee reported total revenues of around $358 million which inched up 0.3% year over year. However, revenues missed the Zacks Consensus Estimate of $369 million. Cost of sales in the reported quarter was up 3% year over year to $273.6 million. Gross profit declined 8% year over year to $84.1 million. Gross margin contracted 220 basis points (bps) to 23.5%. Selling, general and administrative (SG&A) expenses dropped 8% year over year to $52.7 million. Adjusted operating income declined 15% year over year to $32 million. Operating margin shrunk 160 bps to 9%. In the fiscal third quarter, the Architectural Framing Systems segment’s revenues went down 7% year over year to $181 million. The segment’s adjusted operating income in the quarter came in at $13.6 million compared with $21.4 million witnessed in the prior-year quarter. The Architectural Glass Systems segment’s revenues went up 2% year over year to $98.5 million. The segment’s operating income tanked 35% to $5.9 million from $9.1 million reported in the year-earlier quarter. Revenues in the Architectural Services segment surged 48% year over year to $72.8 million. The segment reported an operating profit of $8.7 million, significantly up from $2.5 million recorded in the year-ago quarter, driven by higher volumes and strong project execution. The Large-Scale Optical Technologies segment’s revenues declined 10% year over year to $23.4 million. Operating income in the reported quarter came in at $6.6 million compared to $6.7 million in the year-ago quarter. The Architectural Framing Systems segment’s backlog declined to $407.9 million in the fiscal third quarter compared with $428.4 million a year ago. The Architectural Services’ segment backlog came in at $419 million — an improvement from $405 million in the prior-year quarter. Apogee had cash and cash equivalents of $41.4 million at the end of the fiscal third quarter compared with $12.8 million as of the end of the prior-year quarter. The company generated cash flow from operations of $71 million during the nine-month period ended Dec 1, 2018 compared with $66 million reported in the comparable period last fiscal. Long-term debt was $233 million as of Dec 1, 2018, compared with $216 million as of Mar 3, 2018. For fiscal 2019, Apogee reduced its outlook. The company expects revenue growth to be between 6% and 7% for the fiscal compared to the prior guidance of 8-10%, with lower projected revenues in the Architectural Glass and Architectural Framing Systems segments. Apogee anticipates that the Architectural Glass segment will benefit from strong order flow which should support top-line growth for the next several quarters. Furthermore, the company witnessed lower revenues and profits in Architectural Framing Systems in the third-quarter fiscal 2019, reflecting reduced volumes due to project timing delays. Apogee expects this near-term impact will carry over into fourth-quarter fiscal 2019. However, the company will benefit from strong bidding activity in the Architectural Framing Systems segment. The company also revised its operating margin guidance to 8.4% from the previous 8.3-8.8%. It projects earnings per share for the fiscal at $3.13 compared to the earlier guidance of $3.13-$3.33. The guidance excludes the after-tax impact of amortization of short-lived acquired intangibles associated with the acquired backlog of Sotawall and EFCO of $3.8 million (or 13 cents per share). At this time, Apogee Enterprises has a subpar Growth Score of D, however its Momentum Score is doing a bit better with a C. However, the stock was allocated a grade of A on the value side, putting it in the top quintile for this investment strategy. Apogee Enterprises has a Zacks Rank #4 (Sell). We expect a below average return from the stock in the next few months.